In a final rule issued in the April 15, 2019, Federal Register, OSHA announced that it is making technical amendments to two standards. In Appendix A of the Process Safety Management of Highly Hazardous Chemicals (PSM) standard, OSHA is correcting the CAS number for methyl vinyl ketone. The Agency says a typographical error was recently discovered in the Chemical Abstract Service (CAS) number for methyl vinyl ketone, and that the incorrect number is not valid and does not represent a different chemical. OSHA also is correcting its Slings standard to restore two figures that were inadvertently removed by amendments in 2011. The Agency says both figures are referenced in the definitions of the standard and should not have been removed. The rule takes effect April 15 and does not affect or change any existing rights or obligations. 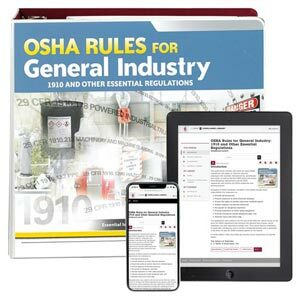 OSHA Rules for General Industry: 1910 and Other Essential Regulations puts OSHA’s workplace safety regulations in a reader-friendly format.